Have you started thinking about Spring entertaining? Well, after you circle some dates on your calendar, take a look at Lettermade…the brand-new, fabulous online shop for the hostess who presents a signature drink with flair! With a vast assortment of chic cocktail napkins, you’ll have your bar cart styled in no time! And, while you’re thinking ahead…order a set for the hostess at the next event you’re invited to. 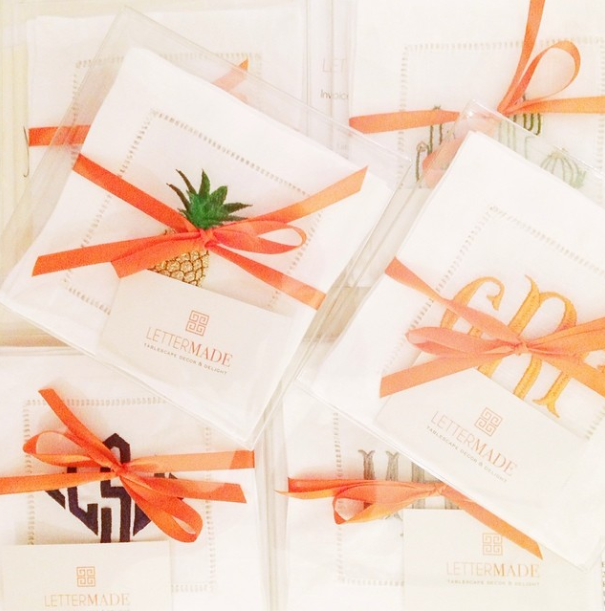 Nothing says “please invite me back” like a customized hostess gift! I know, I know….so many great sets. Which one to choose? Well, for one lucky reader, they’ll get their pick of a set of 4 (valued at $38). Check out the designs Malia has in store right now, then tell us your favorite (or favorites) in the comments below. Giveaway open until March 6th at 12pm EST. Winner will be announced on the blog, as well as via Twitter and Facebook on March 7th! I think it’s time to plan a party!! Monograms are always my favorite! Gorgeous line!! So happy to know of them why use paper when you can have something fabulous like this! Thanks for the intro. I love the sunny pineapples best! I'm so glad to feature you on The Balance Project today, Elizabeth!! You're such an inspiration to busy moms!! Ooh! I love the monogrammed style – but I have a friend who woulld find the elephants simply to-die-for!!!!!! 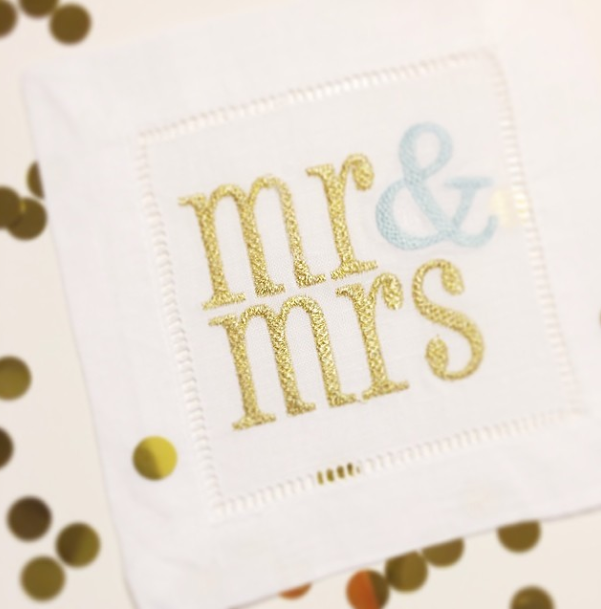 You can't beat a beautiful monogrammed cocktail napkin, and I'm loving the Mr and Mrs…so fun!! Can't wait to see the dinner napkins – happy weekend, Elizabeth!! 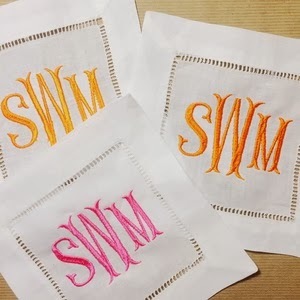 Love the fishtail monograms! A girl can never have to many monograms! 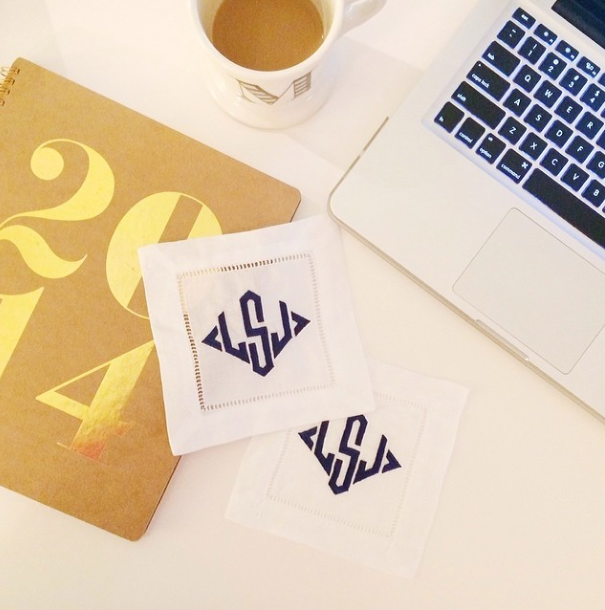 Love the monograms – so classic! I love the Sassy Camel ones! We went to Egypt on our honeymoon & have had a thing for camels ever since. 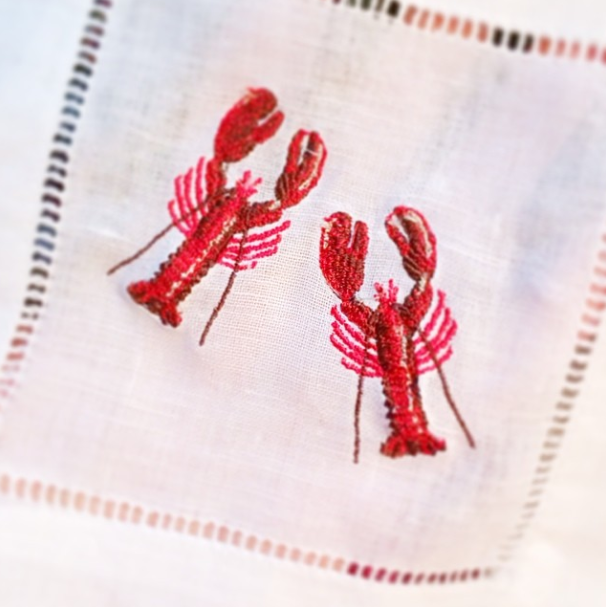 Though I also love the lobsters, the anchors…. so many to choose from! I love in the Navy but then I also love the fishtail monogram and the His Hers Ours. So hard to pick just one favorite. 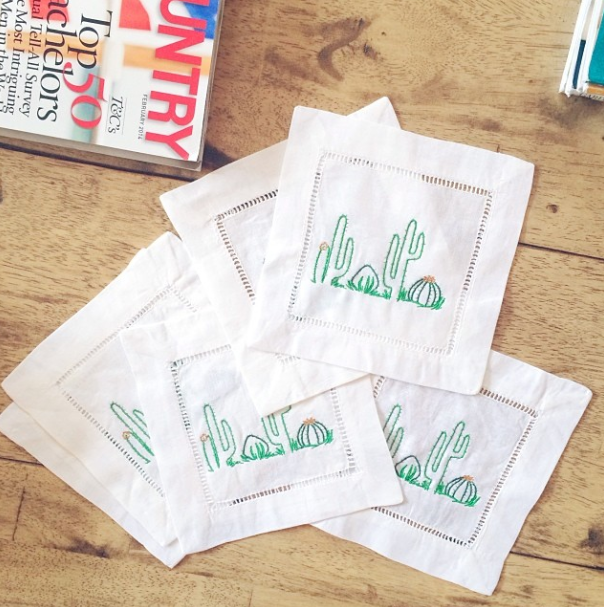 OH I Love this, embroidered napkins.. right up my alley!! I am loving the blue elephants!!! Great giveaway! Have a lovely weekend! These are fabulous! My favorites are the monograms, but I also love the elephants and the Mr. and Mrs (perfect for a bar shower)! My daughter went to Thailand and ever since has loved elephants. I would frame an elephant and camel for her bathroom and use the rest for my cocktails! Everyone is happy! I normally go for monograms, but the elephants are so adorable that I think I'd have to go with those! I love these!!! It is so hard to choose, but I'll choose Garden Party. Thank you, Elizabeth! 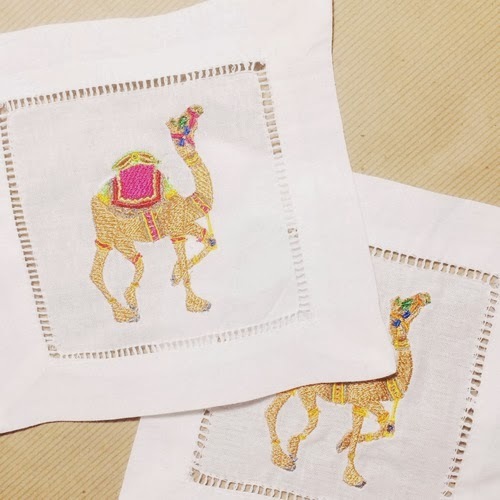 They are all precious….favorites are Pink Elephant, Sassy Camel and the Monograms-great give-away, thank you! And love your blog! Hi — I ADORE the hot pink and orange elephants! Perfect for a gathering of travelers who are going to (or have returned from) a trip to India!!! I have to give a thumbs up to the classic monogram ones — in assorted bright colors!!! The monograms are my favorite, the designs are all so fresh and bright! What fun, Elizabeth, and you know we're in the party mood now that spring is around the corner! Guess which napkins caught our eye – The Bees Knees, of course. Hope you've had a great week; we're in the midst of creating our new collections and missing our blogging friends. The fishtail monogram is really pretty, but for fun I love the Bees Knees in purple! Oh my gosh, how perfect! I love the camel and the monogram. Who wouldn't love a set of these? Thank you for the giveaway! The monograms are my favorite hands down, but the elephants are a close second! Love the monogrammed napkins! The pineapples are great too. Hard to pick! 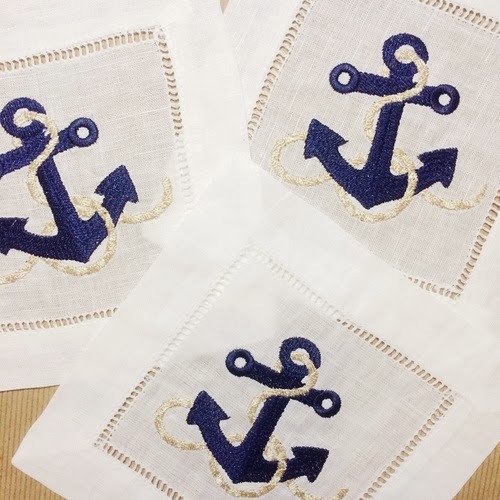 I love the monograms, elephants and nautical designs for the beach! Oh these are so delightful. Love the Mr. & Mrs. Beautiful product. I love the monograms! These would be perfect for my bar! Call Me is most definitely my favorite! Thank you so much for offering such a lovely and generous giveaway. 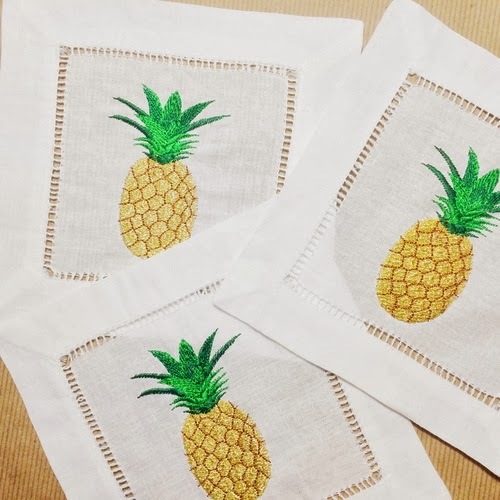 I love the pineapple design ! So cute! Love the mr.&mrs. to give to me nephew who is getting married in May! I love the in the navy! How fun are these?? My favorite are Mr & Mrs and Marfa Cactus! I adore the Mr. and Mrs. and think they would be simply perfect on my gorgeous John Richard bar piece in my cocktail room! Pick ME! Love the monograms and the mr and mrs ones!! 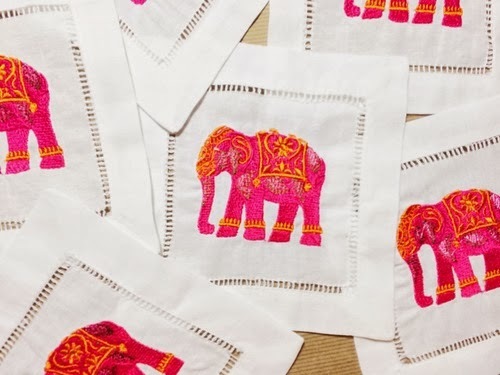 Love the Pink Elephant Cocktail Napkins! Everyone will know they are Lettermade! Thank you for the giveaway fun. My-Otome has a real hurdle to overcome and that's to be able to tell a story that's gucci replica not dependent on knowing the previous series. For people going fresh into the series, I think they'll be able to handle it better than those coming in with the history chanel replica of My-Hime. I found myself spending more time trying to figure out who became who in this new variation and wondering where certain characters are that haven't been introduced yet. There is also a good deal of similarity between some hermes outlet character designs which can throw you off as well. All in all though, My-Otome presents a strong show on its own without the need for the original. Though it's reworking the concept of the original, it brings in so much new material and new ideas that it doesn't feel like a retread.